URL scheme actions and parameters available in OmniFocus for iOS and Mac. Applications are made more powerful with URL schemes. URL schemes are links that launch an application or kickstart extra functionality. Sometimes even for automating common tasks. In OmniFocus they do a few things: launch directly into a particular view, like Forecast, or add new Stuff from other applications. OmniFocus’s URL Scheme got a major update in April, 2016, with OmniFocus for iOS 2.14. On the Mac, OmniFocus 2.10—launched in June, 2017—includes most of the same functionality. There are several ways to add actions to your database—we talk about a few of them on our 3rd party app page specifically about iOS—but a lot more is now possible. That link will work anywhere OmniFocus is installed. The app will launch from Safari, Mail, or any app capable of opening a URL. But a lot more can be done with parameters recently in OmniFocus for iOS 2.14 and OmniFocus for Mac 2.10. You can string these parameters together using & as a separator. Spaces and other special characters might need percent-encoding. Each day, Amanda starts a quick review. It helps her prepare for the urgent and hope-to-do tasks. The bulk of this review occurs with the help of an OmniOutliner document on her iPad Pro. In the Outliner document are specific tasks to perform: some in Mail, OmniFocus, and elsewhere. The Outliner document is a checklist for the daily review but, additionally, also a launchpad. This is where Amanda quickly jumps around by using the URL scheme: she gains focus and saves time by jumping right where she needs to go. For Pro users, custom perspectives work as well. Instead of placing the custom perspective’s title right after omnifocus:///, use perspective/Bills or perspective/Homework. Handling spaces: make sure you’ve added the HTML entity %20 as a substition for each space! 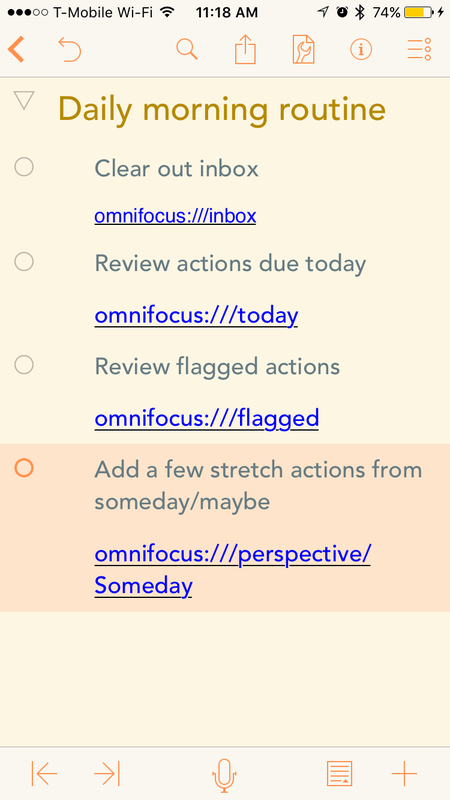 *A note on the omnifocus:///today link: if the Today setting has been changed in OmniFocus Settings, you’ll head there! If you’re using an app that supports x-callback-url (Workflow, for example) the callback will include a link back to the created task or parent project. In addition to the add action, OmniFocus now supports the TaskPaper format for action interchange. TaskPaper-formatted text can be added to OmniFocus by pasting directly into an outline or by using the URL scheme’s /paste action. To pull OmniFocus data in the Taskpaper format, select Copy from the Share Sheet on iOS or choose Edit ‣ Copy as TaskPaper on Mac. Copy TaskPaper-formatted text from any other app, paste it where you’d like it in OmniFocus, and bam—you’ve got all of your data. Ken, our CEO, put together this Editorial workflow that takes the currently-selected text in Editorial (with placeholders for template-specific data) and shuttles it over to OmniFocus, perfectly formatted. If simply activating omnifocus:///paste without any of the above, the clipboard will be parsed and added to your Inbox. For the most part, OmniFocus lines up with TaskPaper tags. The full gamut of tags that can be used are discussed in this forum thread near the end. When adding attachments to new actions, they need to be encoded in Base64. This is easy with Workflow. This shared Workflow takes a file, encodes it, and then sends it over to OmniFocus. It’s a great way to file a PDF away for review from Mail.